I am so proud of how impressed Eloise was of herself on Friday. We stopped in at Dad’s office, ate lunch, had a playdate with a friend and then headed home. While Charlotte and Flora nodded off, Eloise sat in the back absorbed in her book again and I enjoyed an hour of peace and quiet. Just as we were pulling into our neighborhood, Eloise held up her book so I could see it in the rearview mirror and gave me a beaming smile. “I can’t believe I read a whole chapter book in one day!” she said. That’s right, my KINDERGARTENER read 121 pages in one day. She’s reading at a level I didn’t reach until second or third grade! I’d like to take a little credit for Eloise’s reading prowess, but I am absolutely BLOWN AWAY by what she’s learned in her kindergarten classroom this year. In 1988, I attended half-day kindergarten, where I learned my ABCs, numbers, sharing and general classroom behavior. Today’s kindergarten curriculum bears little resemblance to that of my youth. Eloise and her classmates are reading, writing in full sentences, taking spelling tests and doing multiplication and division word problems. At church today, I could barely hold a group of 4- & 5-year-olds’ attention for five minutes, but Eloise’s kindergarten teacher, Angie Bonthuis, has somehow managed to give 20 students the rock-solid foundation on which the rest of their education will be built. In my opinion, Mrs. B is a master of her profession, deserving of a superhero’s cape and a Fortune 500 CEO’s salary. As Eloise’s reading abilities skyrocket, my new challenge is finding beginner chapter books that have stories of substance and are written with originality and creativity. 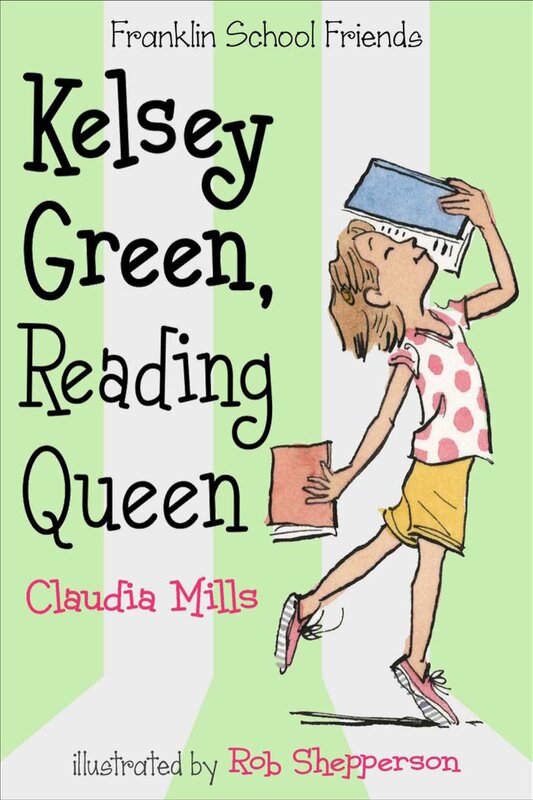 One of my favorite discoveries has been “Kelsey Green, Reading Queen,” written by Claudia Mills with illustrations by Rob Shepperson. The book is the first in what will become a series about the “Franklin School Friends,” including Kelsey and her best friends, Annika and Izzy. In this debut story, Kelsey takes center stage, and we come to learn just how much she loves to read. In fact, her classroom teacher would likely argue that Kelsey likes to read just a little too much, as she’s often caught with a piece of fiction hidden inside her textbook during math lessons. This is one of the many reasons I love Mills’ book so much; over the years, I had more than one book confiscated when I was found reading at an inappropriate time. Kelsey’s obsession is only taken up a notch when the school principal, Mr. Boone, announces a school-wde reading challenge: if the students read two thousand books before April, he’ll shave off his beard. To top it off, the class that reads the most books will be awarded a pizza party and the students who read the most in each classroom will have their name engraved on a plaque. Kelsey develops a cutthroat rivalry with her classmate Simon, a fellow bookworm, in pursuit of the top-reader honors. She becomes convinced that Simon is faking his reading totals and enlists her friends in her efforts to spy on him. On the other hand, the contest also inspires Kelsey to help a classmate who struggles with reading discover a book series he can enjoy (even if her motives are based on her desire to bolster the class’ total). The book is rightly praised for the accuracy with which Mills has written about various school scenarios and everyday challenges third-graders encounter. And Kelsey’s reading list, which includes books such as “The Secret Garden” and “Sarah, Plain & Tall,” serves as a great syllabus for young readers like my Eloise. What are your favorite early chapter books, both new and old? I loved anything by Roald Dahl and Judy Blume when I was young. But, the Chronicles of Narnia are my favorite from childhood and a favorite now. I can appreciate them at any age.